It is almost a year since the release of this movie and I think it will be known like Manichitrathazhu and other gems from the past in the coming years. This movie was the directorial debut of Dileesh Pothan, an AD of Aashiq Abu. 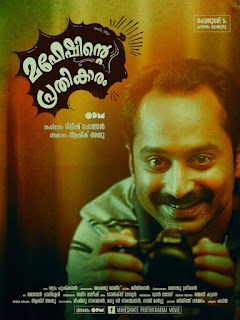 With Shyam Pushkaran's terrific screenplay based on true events (life of Thampan Purushan of Cherthala), brilliant music (background and tracks) by Bijibal, and stellar performances by the entire cast, Maheshinte Prathikaram is a sweet movie to watch. The story takes you through the life of Mahesh who is a small photo studio owner who gets into a fight for his friend and with the defeat he vows to not wear slippers until he avenges for their actions. The characters were weaved into the plot very well and the actors who portrayed these characters excelled in their performance. The character called Mahesh loses his first love, Sowmya (portrayed by Anushree). He then finds his next one in Jincy (Aparna Balamurali). The thing I loved about this is that the breakup was shown very beautifully without bothering the girl. When Sowmya decides to marry someone else for a better life abroad, Mahesh handles it sensibly. He attends her wedding with a smile. It is surely a lesson for those who use stalking as a reasonable theme in their movies to prove just one thing love (unfortunately it doesn't). The movie also used rain as a theme and rain in the beautiful Idukki just made it beautiful to watch. As for the dialogues, '8-inte oru lunar' followed by 'sherikkum' by the shopkeeper at the end of the movie just completes everything. Jincy's 'chettan supera' brings a smile even as I type it out here. The movie totally belonged to Fahad and it took me back to the 80's-90's Mohanlal who portrayed as a common man from small towns. The script could have taken a different twist after the first half but that is where this movie stood out. The second half was something most would not have expected and audiences will surely leave the theaters or their couch with a smile and good heart.